Begin your journey in Nuremberg, where you will board your ship. Cruise through the Main-Danube Canal and then along the Main River and stop at medieval towns seemingly untouched by time. Visit the German villages of Bernkastel and Cochem and experience the dramatic scenery of the Rhine River Gorge, dotted with picturesque fortresses and castle ruins. Explore Trier, the oldest city in Germany, and continue through the meandering Mosel River Valley, its steep hillsides covered with vineyards, before concluding your journey in Luxembourg. Embark your cruise in Nuremberg. Tonight, meet your fellow passengers at the Welcome Dinner. This morning you will arrive in the medieval town of Bamberg a UNESCO World Heritage Site. Disembark for a guided walking tour of this medieval gem and see its cathedral, Old Town Hall and elegant old mansions before stopping to sample some of Bamberg’s famous smoked beer. Continue your cruise early this afternoon. You will have free time after arriving in Schweinfurt tonight. The ship sails for Kitzingen overnight. This morning you will arrive in Kitzingen for a walking tour. You’ll see the famous Leaning Tower, built during the 13th century, the Old Main Bridge, Kitzingen Church and the Renaissance Town Hall. Later, the Aulic Council and Wine Queen will welcome you to one of Germany’s oldest wine cellars, where you will taste several different wines and learn about the history of wine production in the region. 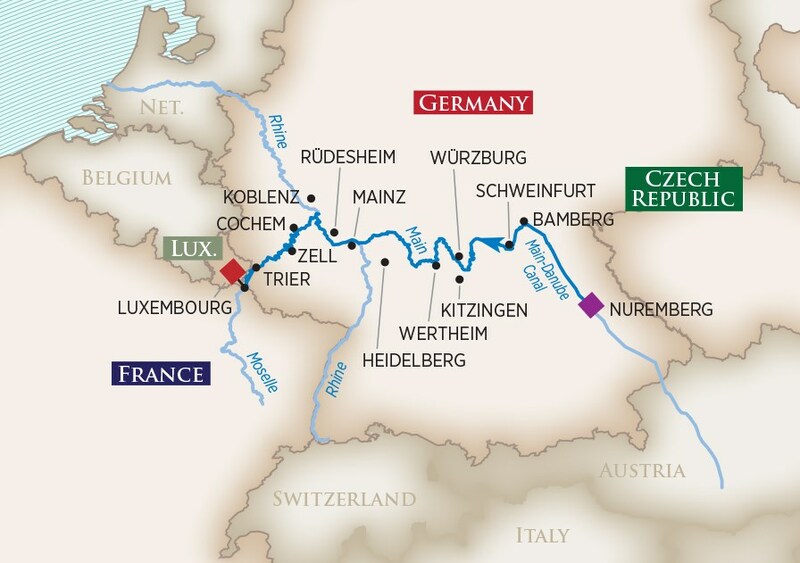 Or choose a more active option an join the Kitzingen bike tour. 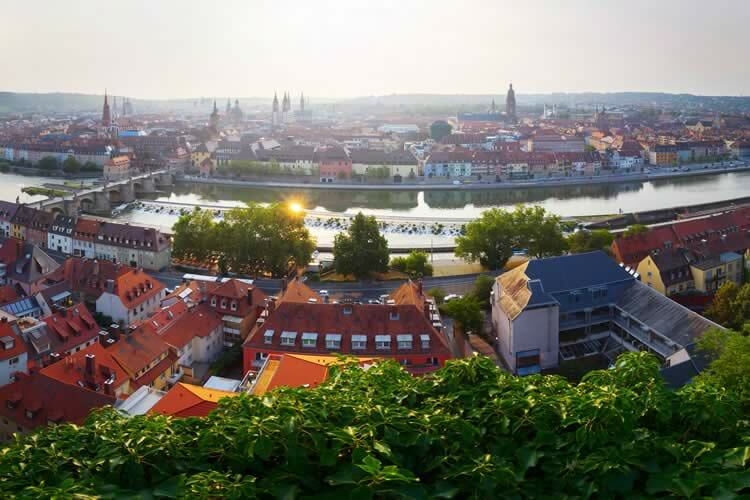 This afternoon’s guided tour of Würzburg will show you all of the city’s major sights as well as the Residenz Palace and gardens, a designated UNESCO World Heritage Site. We cruise overnight tonight to Wertheim. Welcome to Wertheim, a quaint German town known for its intricate glassworks and charming medieval architecture. You have your choice of one of three excursions today. Enjoy a guided walking tour of the historic city center, a guided bike tour along the Main River, or visit a local bakery for a Pretzel-making demonstration and tasting. After lunch, the ship will cruise towards Mainz. 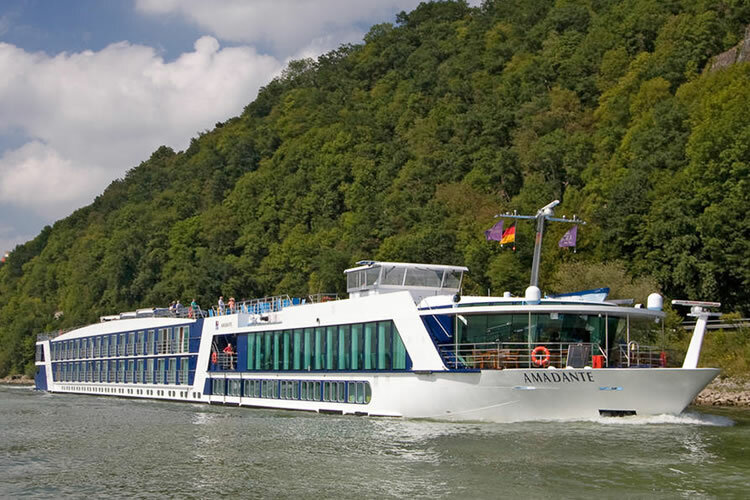 This morning arrive in Mainz after breakfast and choose one of three excursions. Your first option is a guided walking tour of Mainz to see the famous Chagall stained-glass windows, which depict scriptural scenes in stunning blue. Your second option is to travel by motor coach to Heidelberg, Germany’s oldest university town, where you will tour the old town and visit the red-walled castle with its Great Vat (a 49,000-gallon wine cask) as well as enjoy beautiful views of the Neckar Valley and the city below. Or, for your third option, join the Tastes of the Rheinhesse region tour to sample savory sausages, cheese and breads. Later, stop in Rüdesheim and visit Siegfried’s Mechanical Musical Instrument Museum, or you may choose to join us for some Rüdesheimer Coffee. 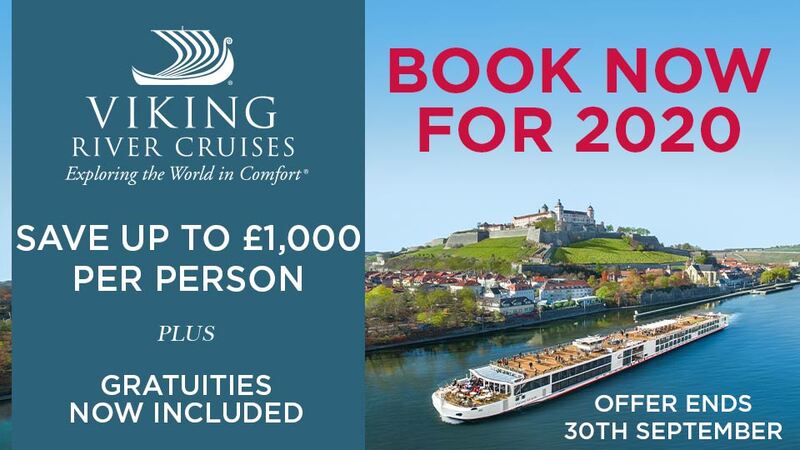 From Rüdesheim, cruise towards Koblenz through the Rhine River gorge, famous for its beautiful and imposing castles and the legendary Lorelei Rock. After dinner, join a walking tour of Koblenz and explore its charming town square and quaint shop Later this evening the ship cruises overnight towards Cochem. Wake up this morning in Cochem, a fairytale village surrounded by scenic vineyards. Walk along narrow cobblestone streets lined with medieval houses and enjoy a guided tour of Reichsburg Castle situated high above the town. From the castle’s grounds, you’ll have a spectacular view of the river. As an alternative, visit the Cochem Mustard Mill, one of Europe’s oldest working mustard mills producing. It produces various types of mustard – one of which is from a 15th-century monastic recipe. Enjoy a guided tour and learn about the history of the mill, see how mustard is made and sample some of Chochem’s famous mustard. You may also opt to take a guided bike tour (capacity controlled) through the region’s incredible landscape. Early this afternoon, the ship will cruise past hillside vineyards en route to Zell, arriving early evening. The town’s Mayor and Wine Queen will be on hand to warmly welcome you to a memorable wine festival. The ship moors overnight in Zell. The ship arrives mid-afternoon in Trier, Germany’s oldest city and a UNESCO World Heritage Site This area is renowned for its rich ancient Roman past, and your guided tour will include such sights as the old Roman amphitheater, Roman Baths, Basilica of Constantine and the Porta Nigra gate that dates back to 180 A.D. Alternatively, join a bike tour to see Trier’s historical center before cycling along the river bank path towards Senheim. This evening, the ship cruises towards the Grand Duchy of Luxembourg. 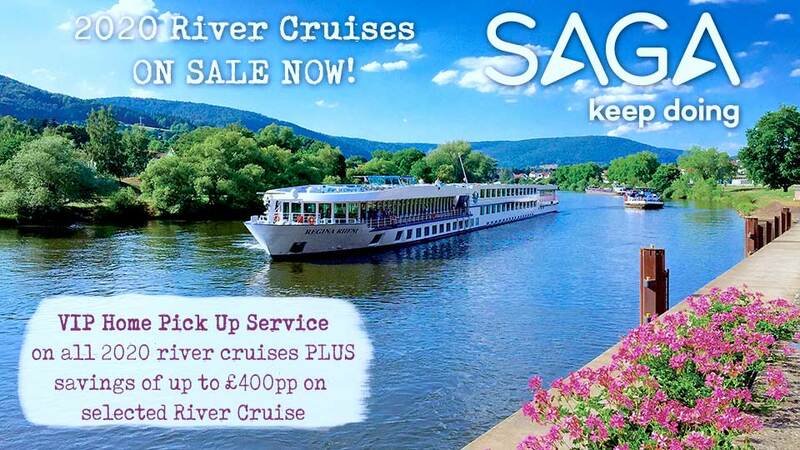 This morning, bid farewell to your luxurious river cruise ship.